Hendersonville Republican Tom Apodaca (that's him to the left) is Chair of the NC Senate Committee on Rules. 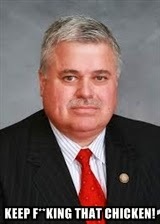 He's kind of a big deal among the new Republican majority in the Gone-to-Hell NC General Assembly. Tom Apodaca used to be for independent redistricting commissions when he was in the Republican minority. Apodaca co-sponsored a redistricting reform plan three different times, including in the 2009-10 legislative session, shortly before he became such a born-again big effing deal. A group of bipartisan General Assembly members -- including (gasp!) the excessively "moral" Paul "Skip" Stam of Wake County -- are planning to file two different bills to move redistricting out of the purely political arena where it is currently wedged like a ham bone in a dog's throat and into the purview of an independent, non-partisan redistricting commission. But Apodaca likes the way things are now, since he's a big deal. He's such a big deal that he couldn't resist strutting like Mussolini to a WRAL reporter. He said about the proposed legislation, "God bless 'em. I can't wait to get it over here [to the NC Senate] It's dead. It's not going anywhere." When you've got a big-assed Republican declaring what's dead and what's not, you can kiss your dreams of fairness goodbye. A plan does not exist to be fair in redistricting as well as person who is fair. Democrats are crying because they want back in power. I say go Apodaca. Have you no shame? Democrats in Watauga pushed for a non-partisan redistricting plan for the last 12 years. There ARE states with such processes....look at Iowa. Their congressional districts are compact and balanced. None of them look like salamanders, the way North Carolina's do.